The perfect location for your next family reunion! 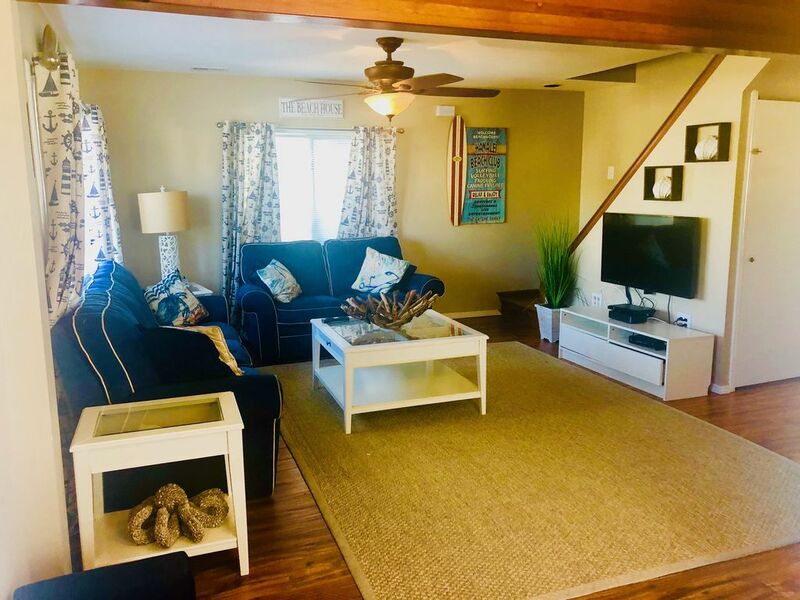 Four bedroom, three bath home with fantastic location in Beach Haven, sleeps up to 9 in main house. Second large 2br/1bath (~1k sq ft) apartment located above garage that sleep up to 6. Park your car and walk to everything downtown Beach Haven has to offer! Property has a large paver patio with outdoor gas grill and furniture. Bayside, with a short walk to both the beach and bay. Also, a short walk to Fantasy Island, BayVillage, mini golf, shops, theater, Murray's supermarket and all restaurants. Inside amenities include refrigerator/freezer, oven, dishwasher, coffee maker, toaster, full size washer/dryer, cable, wireless internet and phone. Master Suite w/queen bed, TV, full bath with jacuzzi tub and separate shower. 2nd bedroom has two full beds, 3rd bedroom has twin over full bunk beds, 4th bedroom twin bed with pull out twin trundle. Off Street Parking. Central Air. No pets, No smoking. Apartment includes 2 bedrooms (3 full beds),1 bath and a full kitchen. Amazing Week - Absolutely no complaints!! My family and I had the opportunity of staying at the Capone Beach House and we had a wonderful time. The house is clean, a perfect size, and has an awesome backyard for hanging out after the beach. A major plus is the rec room/bar in the garage. We had a blast hanging out in there. We had 4 little ones, and the house was ideal with tons of toys and baby gates throughout. The location was perfect, walking distance to so many of LBI's treasures. Matt was also very easy to work with, we definitely would recommend staying at this beautiful beach house. We will 100% be back! Had 13 for our annual family vacation, and everyone said this was the best yet. Location was great, house was perfect, the garage got used by both the kids and grownups alike. Had everything we needed to make it a memorable vacation. Matt the perfect owner. Walked to everything, beach, fresh market, restaurants, amusement park, and even live theater. My family and I had a wonderful vacation during the time we spent at this house. It was clean, big, and close to everything. We didn't drive all week. It has newly remodeled bathrooms, great outside entertainment space, and an extra apartment in the back for guests. Anyone would be lucky to stay here for vacation. Thanks again for having us! The house was very clean and perfect for our family. We had an amazing vacation. The home owner Matthew was very responsive and helpful providing suggestions and recommendations. When you first walk in the living room looks cozy but held 8 adults and 3 toddlers running around. The only time we spent in the living room was the transition from dinner to bedtime. Most of our time was at the beach, boat rides or playing in the amazing backyard! This house is perfect for large families with/without kids. We never used our car because the house was in walking distance to everything we needed. We cannot wait to come back! Our stay was nothing short of amazing! The house is in a perfect location to the beach, restaurants, grocery store and amusement park. What more can you ask for! And the owners of the house are wonderful and so accommodating. We will for sure return! This home amazing! Gorgeous decor, clean and comfortable. The location is perfect for LBI. I don't think we used the car once all week! Everything thing you need is well within walking distance. The kids had an great week full of memories to last a lifetime! And so did the adults too... The owners are amazing and accommodating! Thank you E & M ~ you are the BEST!!! !